Amid rising tensions in East Asia, a new report finds that while relatively few Chinese (12%) regard the United States as an enemy, about four-in-ten Chinese (41%) see the U.S. military presence in East Asia as a major threat to their country and an even greater number (63%) see the U.S. as the nation posing the greatest threat to China. The survey of China was conducted in May-August 2012 by the Peking University’s Research Center for Contemporary China (RCCC), before the recent escalation of territorial disputes in the East China Sea, including China’s declaration of an air defense zone in the area and the U.S. decision to challenge it by sending two B-52s through the contested airspace. In addition to the general public, the survey also examined the views of five elite groups: government officials, journalists, business leaders, military scholars, and non-military scholars. Majorities in four of these five groups described the American military presence in East Asia as a major threat (non-military scholars were the lone exception). The survey was conducted as part of the U.S.-China Security Perceptions Project, a partnership among five organizations: the Carnegie Endowment for International Peace, the Pew Research Center, the Kissinger Institute on China and the United States, the China Strategic Culture Promotion Association, and the RCCC. As part of the project, Pew Research conducted a survey of the American general public and U.S. foreign policy experts in 2012. The RCCC poll finds that the Chinese public is somewhat more concerned about America’s military power (34%) than its economic power (20%), although many respondents say they are worried about both (16%) or neither (21%). In contrast, Americans largely view China through an economic lens: 59% say they are more concerned about China’s economic strength than its military power. Even though there are clear concerns on both sides of the Pacific, relatively few Americans or Chinese see the other country as an enemy. 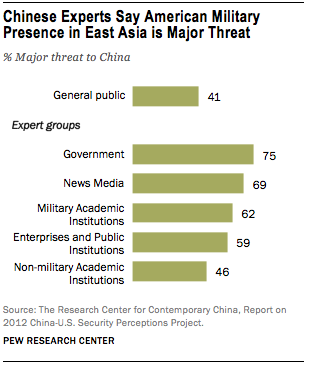 Just 15% of Americans view China as an enemy, while only 12% of Chinese say this about the U.S. Instead, the prevailing view in both nations is that the other country is a competitor. However, American and Chinese foreign policy experts have different views about China’s growing power and what it might mean for long-term global stability. Chinese experts tend to believe that in the long run, the world will be more stable if there is a balance of power between the U.S. and China. 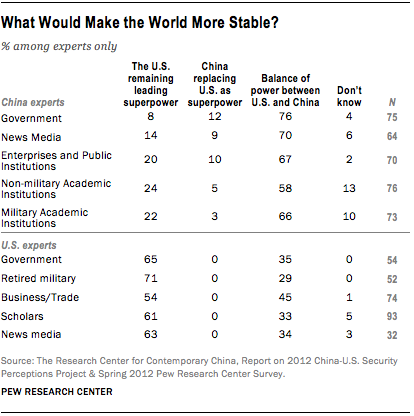 This is the majority view among all five expert groups, although as many as one-in-five non-military scholars, military scholars, and business leaders say that the world will actually be more stable if the U.S. remains the leading superpower. Meanwhile, most American experts think the world will be a more stable place if the U.S. continues to be the dominant power. However, significant minorities, including 45% of business leaders, believe stability would be enhanced by a balance of power between the U.S. and a rising China.